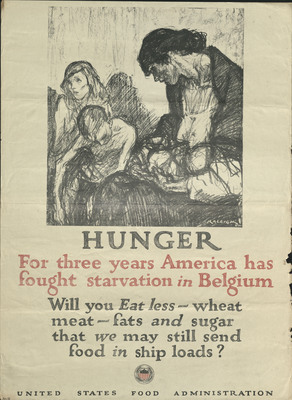 “Hunger: For three years America has fought starvation in Belgium. Will you Eat less-wheat meat—fats and sugar that we may still send food in ship loads?” The poster begs the question of how Belgium got into such a dire situation. The German invasion of Belgium in August of 1914 quickly became brutal. After a brave defense, the small Belgian army, led by their king himself, fell back in retreat. While invading, German soldiers greatly feared civilian resistance. Not having time to differentiate between submissive citizen and resistor, the opening weeks of the war devolved into mass destruction and killing of civilians. The plight of war-ravaged Belgians immediately caught the attention of sympathetic Americans. In Gettysburg, Pennsylvania, another town once devastated by war, citizens began fundraisers to benefit Belgians as early as 1915. Gettysburg citizens sent clothes and items needed to care for war-orphaned infants. Belgian sympathy ran high at a national level also. In 1917, the United States government asked well-known illustrator Henry Raleigh to create war posters. Raleigh had illustrated for The New York World and The Saturday Evening Post. In 1918 the U.S. Food Administration chose Raleigh’s “Hunger” and distributed five million copies. The poster depicts a starving mother with her face downcast and turned away. In her arms slumps an infant, possibly already dead from starvation. Her other children sit next to her, emaciated and skeletal. In three years the German occupation had taken its toll on the family, the father is nowhere to be seen, perhaps killed in the army or in the opening weeks of the invasion. The poster calls on Americans, living in the land of plenty, to reduce consumption of wheat and meat so that food could be sent to these starving people. Indeed, the war had thrust America to the forefront of the export business and the wheat crops were plentiful. Throughout America, a spirit of selflessness was encouraged to provide for her allies, Belgium especially, and keep them afloat as the war took its terrible course. Johnson, S. Marianne, "Hunger" (2014). World War I Poster Project. 2.